The zombie-infested sandbox of DayZ can produce astonishing stories of survival against the odds. You must scavenge for food, water and weapons in vast, open terrain, rich with forests, towns and old bunkers. However, in spite of the weather and the infected shamblers, the greatest threat to your survival is often other players, who'd sooner shoot you at 20 metres and take your stuff than actually try to work with you to survive the harsh wilderness. DayZRP is the answer. It's a dedicated roleplaying server designed to help everyone create better stories. You can still betray players and form enemies as well as alliances, but the server puts a few key rules in place to stop the rampant banditry that can spoil the game. You can lose everything in a matter of seconds, and non-stop predatory behaviour can create a futile environment for those who don't yet have the gear to defend themselves. To address this, there's no killing on sight or camping in cities to snipe new players on DayZRP, and there's a strong community both within the game and beyond it, on DayZRP's official forums—a great place to swap stories, cement alliances and to make friends with the huge number of DayZ roleplayers out there. Adventures on DayZRP are couched in a detailed backdrop of lore that describes the initial outbreak of the infection, how it spread, and how it one day might be cured. Within this world players have already been telling stories from the wilderness. The chronicles of the Nicest Guy In The Wasteland tell the story of a survivor desparate to keep those close to him safe in the zombie apocalypse. Aurora's Thoughts takes things further, using audio diaries to bring the character's ongoing survival story to life. Legendary alliances have formed over the course of the server's life. Yet shadows loom over Chernarus. Rumours of disappearances are chilling, the few who crawl to freedom raving about human blood sport. Hatchets do terrible things in the hands of desperate men. Even respected clans wrestle with dissent, erupting sporadically into civil war. By casting out one of its own, the French Foreign Legion risked destruction at the hands of an egotistical tyrant. For more examples of the sort of adventures that can happen on DayZRP, look no further than this armed heist, a story of a hold up, a dead brother, and twisting allegiances. Other unfortunate infected souls tell of desperate journeys to reach the hospital, only to have friends fall mere metres from the hospital doors. It's a cruel world, but a fascinating one. The best things happen when players team up to raid, build, or just joke around. Still, on DayZRP you're free to join a clan, or you can form a small group of friends, or even strike out on your own. 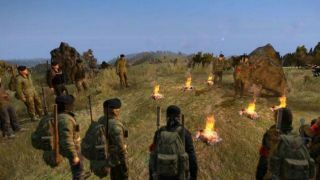 Within the server's simple rules you're free to forge your own life in DayZ with the pleasure of knowing you're part of something bigger—a community that enjoys the drama and player interactions that make DayZ special. DayZRP is moderated 24/7 and is considered to be the number-one roleplay server for the game. It's easy to join. You must be 16 or over to apply, and can do so quickly using the instructions on the DayZRP site. A friendly welcome awaits—DayZRP is looking to grow and invite new players into the fold to create epic new stories in DayZ's deadly wilderness.